Penny has learned to climb the fence. It was only a matter of time. Fortunately, she hasn't yet learned to jump down, so she hasn't got stuck in anyone else's garden yet. Yet. It's only a matter of time. In the meantime, I've been getting her down from our fence with a wash-basket. What is it with wash-baskets? Every cat I've known has loved them. They're good for sitting, fighting, playing and sleeping in. Penny finds our one almost compulsive, so I hold it up to the fence and she jumps in. Three times so far this morning. The back door is now closed. She can't yet work the cat-flap, but that is also just a matter of time. 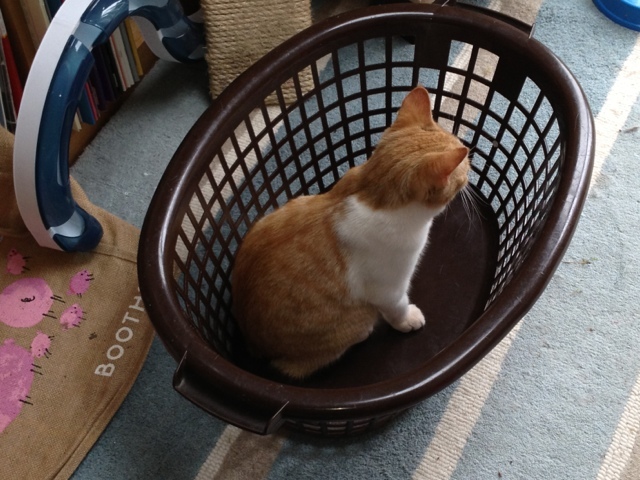 Penny in her wash-basket, contemplating her next adventure.